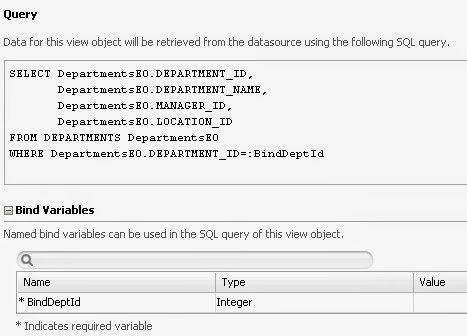 This post is about a very basic question- How to set the value of view object bind variable in Oracle ADF? So for this type of requirement, we can set bind variable’s value in such a way so that we need not write code everywhere to set changed value. This method (introduce in 11.1.1.5 release) executes before bindParametersForCollection, the same thing can also be done in this method. This method invokes just before framework executes rowset, avoid setting bind variable in this method because it is not called before some methods as getEstimatedRowCount(), So whenever you try to get the row count it will return wrong values. 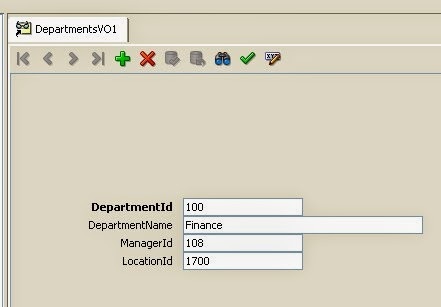 It is showing data for DepartmentId 100. Please let me know if the method getCriteriaItemClause() gets called before or after bindParametersForCollection() . Thanks for the reply. Is there any method called after getCriteriaItemClause() but before executeQueryForCollection() ? We need a method wherein we could change the clause generated by getCriteriaItemClause(). Is there a method where this could be done? I use the second solution it work very well, but i have problem the value of the variable is the user_id in the authentication page i put it in setter but i don't know how can'i use it in my method prepareRowSetForQuery, im new in Java and ADF, can you help me please. hi Ashish!! 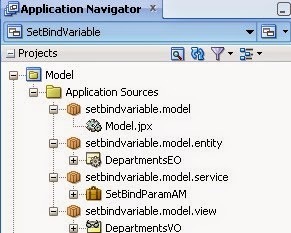 i am trying to create and extend the sample app Create Rich Web Application in JDeveloper 11g, i want to set value of ManagerID when user select/enter new or update a DepartmentID (in HR schema there are ManagerID'z in Departments table ) i know it is very basic question but i want to do it, here is lack of knowledge of java but i can write various SQL and PL/SQL code in oracle 11g. also I have an account of Oracle Community Forums with same name here i posted. I have tow variables in table: ispartner and isClient. If isClient is ture then isPartner should be false. if (isClient==false && isPartner==true )then query condition should be (isClient=true OR isPartner=true). if(isClient==false && isPartner==false) then query condition should be (isClient=false AND isPartner=false). how to write is executeQueryForCollection()? thank’s, you help me so much with this post. I been trying this with override executeQuery(), without success.